The modern workplace is changing, with more communication via email and phone it sometimes seems that walking is in crisis. This is where the LifeSpan Fitness TR800-DT comes in. 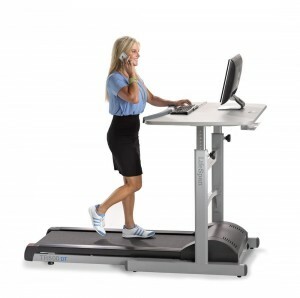 Unlike normal gym treadmills, such as the Lifespan TR3000i this is designed to be used in the workplace. Great for those tied to their desk, bloggers, writers, office workers needing to find time to exercise more. The most noticeable feature of this treadmill is the large desk area. With a generous space of 46.5″ by 31″ deep there is plenty of space for a laptop or monitor, with room to spare for the mouse and keyboard. As you can spread out on the desktop you wont feel confined, and will be able to work effectively. To ensure that the desk is solid and stable its made of thick board and laminate, the 1″thick board will feel solid and stable. It is supported by a strong steel frame, and there is a convenient cable tidy system located at the rear of the desk to keep everything neat and tidy. Note: If you are comparing prices, and you want the integrated desk, make sure you chose the DT model. The DT3 version does not include the desk, and you will have to source your own. If you browse amazon you can pick up a desk for about $650 which works out about the same as buying the DT with integrated desk. There is a stripped down treadmill console fitted to the front of the TR800-DT. As its not part of the working surface its not taking up real estate that can be used for your computer. 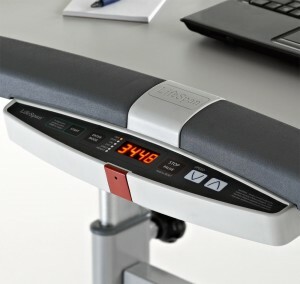 Its LED display shows a step count (based on a highly accurate Intelli-Step System), distance, time, calories. There are no work out programs to follow, as this is designed to be a compliment to your working life, not a full on workout system. The motor is the most important part of a treadmill, and two aspects are important, its output and reliability. As this machine is not designed for running the 2HP Continuous Horsepower output is almost over kill. This does mean that it will never be working at its maximum effort, even when its speed limit of 4mph is reached. In turn the reliability of this motor is very good, and LifeSpan offer a 3 year warranty on the motor. To ensure the life of this motor Lifespan do recommend using this treadmill for a maximum of 3 hours a day. If you plan on walking longer each day then we would suggest upgrading to the higher end TR1200-DT, which comes in about $200 more than the Tr800-DT. The key difference between the two models is the upgraded motor, designed to run for longer with a 2.25CHP motor. With its generous 18″x 52″ walking area even the tallest users (6’4″) should feel comfortable. There is plenty of room for a long relaxed stride to give a very natural walking style, without ever getting that “falling off the back” experience that you can sometimes get. If you use the LifeSpan app, and are a member of the LifeSpan Fitness Club, then you can wirelessly sync your workout to your computer. The App is available here. Warranty: Frame Lifetime, Motor 3 years, Parts and Labour 1 Year. The most appreciated comments were around the build quality, and ease of building walking into the daily routine. Infact one user claims to have lost 40lbs just through using this treadmill! However, users also feel that it does take time to master typing while walking, and one user says that the treadmill is a bit louder than expected, but he goes on to say that you can still hold a phone conversation without any problems. Experts recommend at least one hour or brisk walking a day. With this treadmill you can achieve three times more than that. With a good build quality and comfortable motion this is probably the easiest way of getting in the miles without leaving the office. If you are looking for the best price we would recommend checking out Amazon for the best price LifeSpan TR800-DT, buy now and you can save 24% off the $1699 RSP.